Butch passed away Thursday, November 22, 2018 at his home in Martin. He was born February 18, 1937 in Shelbyville the son of Sierd and Grace (Van Dyke) Hoekstra. Butch proudly served his country in the U.S. Army. 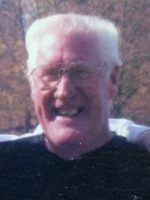 He had worked at West Tab Paper Mill and at Lapham Heating and Cooling until his retirement. Butch enjoyed golfing, fishing and hunting. Most of all he loved his family and spending time with them. He was a member of the Otsego VFW Post #3030 and the Eagles Aeries #2093 of Medford, Oregon. On January 16, 1960 at the Martin Methodist Church he married Marlene Boniface who survives. Also surviving are his children, Randy (Dawn Hodges) Hoekstra of Shelbyville and Todd (Sheila) Hoekstra of Kalamazoo; 3 grandchildren, Tracy (Raigen) Blake, Scott (Katlynn) Hoekstra and Trevor (Lauren) Hoekstra and his siblings, Albert (Florence) Hoekstra and Gertrude Hoekstra along with several nieces and nephews. He was preceded in death by his parents and sisters, Jose Talsma and Flora Zeinstra. A memorial celebration will be held Friday, November 30, 2018 from 4-7 P.M., at the Otsego VFW Post #3030. Private family burial of ashes will take place at East Martin Cemetery at a later time. Contributions in memory of Butch may be made to Hospice Care of Southwest Michigan or to Boys Town. Offer Condolence for the family of Sierd “Butch” Hoekstra Jr.
Posted by Winkel Funeral Home on November 22, 2018 4 Comments on Sierd “Butch” Hoekstra Jr.
Our Sincerest, Most Heartfelt Condolences To Everyone. May Our Lord God Hold You In His Loving Arms During This Very Difficult Time. So sorry for your loss. You both have been good friends to me over the years. May you find peace and comfort in all of the good memories from your life together. Our deepest sympathies to Aunt Marlene, Randy and Todd and to the rest of the family. Many good memories over the years camping, fishing and just hanging out with our families. The entire family is in our prayers. We are so sorry to hear of your loss. Mom so enjoyed her visits when she came to get her hair done. Our prayers and thoughts are with you.